Still tired when I got up this morning. 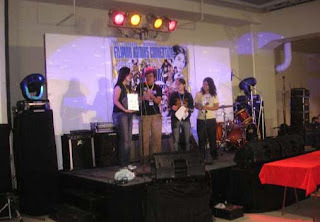 Participated yesterday in the Komikon 2009/ Philippine International Cartoons, Comics and Animation (PICCA) event in Megatrade Hall, Megamall. I arrived early, like, before 9 am and fixed my Callwork on the SKP desk. We were located right through the entrance (at least away from the band). 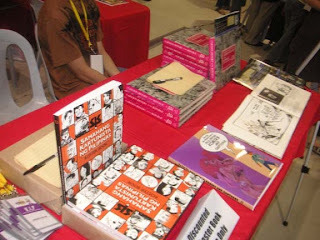 Then I saw Jonas, Johnny, Neil already all set with the Komikero Anthology 3. 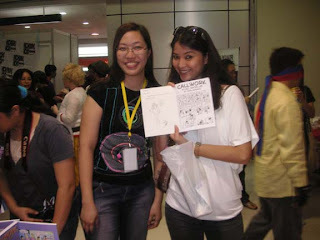 Bought Beerkada graphic novel right away from L, Trese 3 and Kikomachine 12. Gerry arrived with his new book "Where Bold Stars Go To Die". Again, I didn't wait any longer and bought the books. 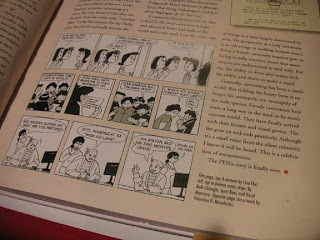 Then went to Comic Odyssey to look for good buys. The rest, I just waited for them to officially open their booths before purchasing. Below are the SKP coffee table books. 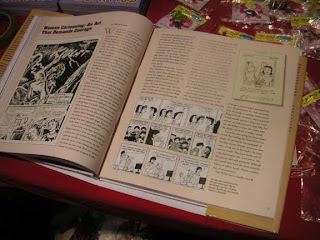 This is Andrew Villar with the book, "One Hundred Years of Philippine Comics" by John Lent. Our works were also featured in this big book. This is Grace. My college barkada in UP CFA. Ang lokaret, mukhang tuwang tuwa naman sa hawak niya... teka ano ba to? See this guy? Nah, he is not my boyfriend. 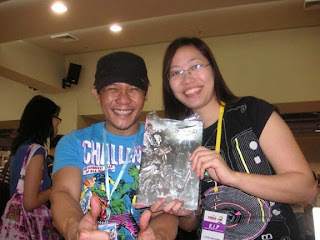 He is Mike, the TV show host of Front Act in TV5. He interviewed me yesterday and I think it will be aired on November 1st with Stanley Chi. 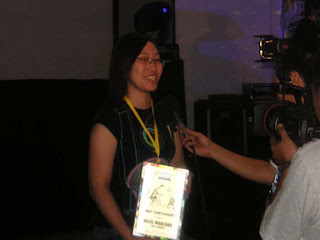 Then the Komikon Awards. It was a surprise. Really. 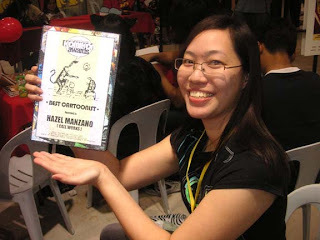 I won the Best Cartoonist! Then JACK TV interviewed me. I forgot to ask when it will be aired. Artistang artista ba ang dateng ng lola niyo? Ayan, my loot bag from the event. 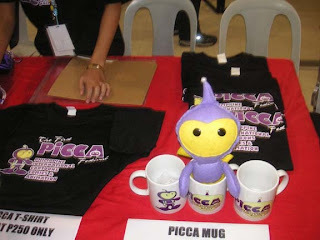 Thanks to Macoy for the free shirt, Greepo Komiks for the free komiks, SKP for the free table, Mr. Yonzon for including callwork in the PICCA exhibit in Podium, Borge for the free komiks, Dex, Ariel, Syeri, L for the free water, Andrew and Freely for the free komiks, jing for the free PICCA items, Gilbert for the free komiks, Ed for the free komiks, teka... puro free di naman ako mukhang free. Marami rin naman akong binili noh.. just look at the picture above. 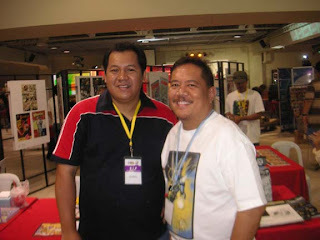 Amos, congrats nga pala sa Larry Alcala Award! And to Bryan for being there all the time till the end. 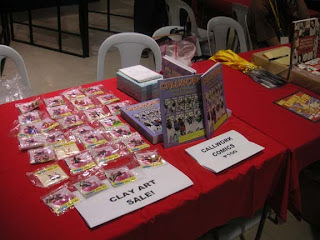 You will also see Callwork included in Komikero Anthology 3 and in Bayan Knights 3. 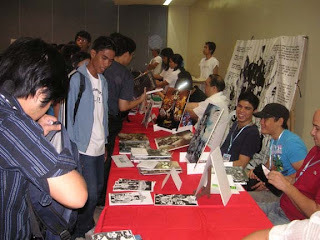 Thanks to all who bought my comics and to the Komikon committee. Went to eat pizza dinner with Bryan around past 7 pm since the Bayan Knights gang still stayed until 9 pm. 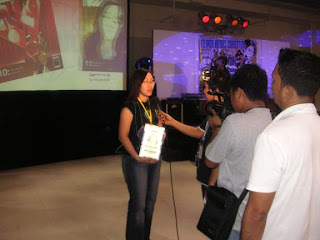 Nga pala, thanks to all who went to my table and greeted me. It was truly an enjoyable event because of all your support. Mwah! Awesome! You are the best! thats why you get the Best Cartoonist Award! God bless! 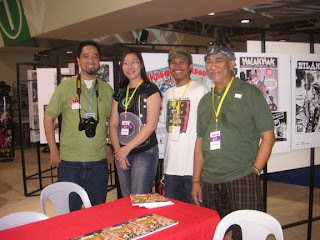 andami mo rin komiks na nakuha sa komikon! yey!